West of Ouray Colorado sits a truly magical area called Governor Basin. At 12,000 feet elevation, Governor Basin is often unrivaled for the carpets of colorful wildflowers and meadows of green grasses as far as the eye can see. The basin is surrounded by the jagged Saint Sophia Ridge and offers unparalleled views overlooking Yankee Boy Basin and the Twin Falls, as well as several 13,000 to 14,000 foot adjacent peaks. 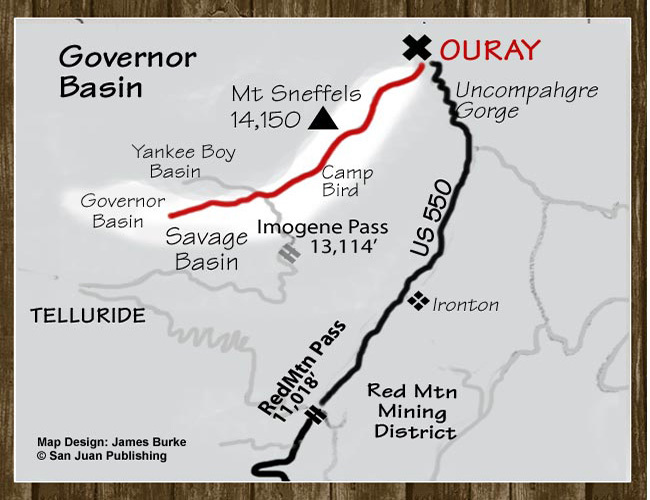 Governor Basin is also rich in mining lore with the historic Virginius Mine located on a spur just off the main trail. While every Jeep tour in and around Ouray Colorado is incredible, Governor Basin ranks up there as a ‘must-do Jeep tour’ for a half-day adventure. This itinerary is generally available from mid-July to late September. Depart from Ouray, Colorado. View rare alpine meadows and wilderness and ‘above tree-line’ vistas and the jagged San Sofia’s Ridge. Ascend through the ghost town of Sneffels and then up a narrow precipice to the historic mining ruins of the Virginus, Humboldt and Mountain Top mines. Explore the spectacular Mountaintop Mine boarding house ruins. Governor’s Basin was also the first area to house a mill inside of a mountain at over 11,000 feet. Truly a unique perspective of the mining at the turn of the century. Beautiful views overlooking Yankee Boy. Half Day: $64.50 per adult and $36.50 per child 4-12.